The renowned Salem witch trials took place in colonial Massachusetts from 1692 to 1693. During this period, an approximated two hundred people were accused of witchcraft and twenty people were executed for similar accusations (Marion, 2007). The Salem witch trials commenced after a group of young girls in the village claimed to have been possessed by the devil and blamed it on several local women for practicing witchcraft. The result was the spread of hysteria in the village of Salem and throughout the colonial Massachusetts. The claims of witchcraft prompted the creation of a special court that convicted the people found of witchcraft in the next several months (Marion, 2007). However, the colony later admitted the erroneous nature of the trials and compensated the families of the people found guilty. This paper will entail an analysis of the Salem witch trials including the context and outcomes of the event. The experience of fits that included aggressive contortions and unmanageable outbursts of screams by girls in the family of the village’s minister marked the onset of the Salem witch hunt and consequent trial (Jenrette et al., 2012). The girls, Elizabeth Parris and Abigail Williams, were diagnosed as bewitched and other girls in the village reported similar symptoms. After the prevalence of the cases, three women including Tituba, Sarah Good, and Sarah Osborn were arrested (Jenrette et al., 2012). The girls accused the three women of bewitching them. Tituba confessed her guilt in hopes of saving herself although the other two women denied their guilt. The case caused hysteria to spread in the village, and this contributed to new people who were accused of similar charges. The accusations were many, and members of the village considered upstanding found themselves as suspects of witchcraft. 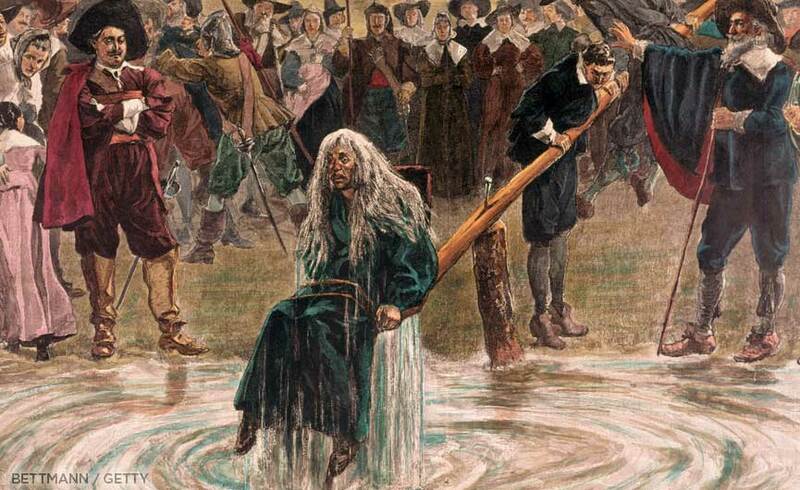 The Salem witch trials took place during a time when Puritans lived in a period of the belief that the devil reincarnated as a physical being who sought to sway them from the path of righteousness. The belief in the supernatural particularly the devil and the use of witches as servants emerged in Europe in the 14th century and spread to the colonial New England (Marion, 2007). Numerous people who practiced Christianity and other religions at that time believed that the Devil could bestow powers to witches to harm other people in exchange for their loyalty. A “witchcraft fad” spread through Europe from the early 1300s to the end of 1600s. During this time, thousands of people were considered witches, and they were executed (Marion, 2007). However, the Salem trials occurred as the witchcraft craze was fading from the society. The local circumstances in Salem could have contributed to the onset of the hunt for witches in the village. During the time of the Salem witch trials, the village faced a range of harsh realities that may have predisposed them to the superstitions of the Devil and witches. The village experienced the ripple effects of the British war with France that included a displaced population who strained the existing resources (Woolf, 2000). The problem of resources further aggravated the feuds between families with links to the riches of the port of Salem and those that continued to rely on agriculture. Conflict further ensued after the ordainment of the first minister in Salem in 1689 who the people hated due to his stringent and greedy nature (Woolf, 2000). The inhabitants of Salem village including the Puritans ascribed the conflict to the works of the Devil. The villagers of Salem were also victims of a recent smallpox epidemic that prevailed in the American colonies. Coupled with these tensions in the village, the Salem witch trials were induced by the villagers’ suspicion, fear, and resentment of both the neighbors and outsiders. The villagers were therefore likely to attribute unexplainable phenomena including violent contortions and outbursts among girls to the activities of witchcraft (Woolf, 2000). The prevailing beliefs of the Devil and the harsh realities inclined the community members to consider witchcraft practices in the village. The admission of spectral evidence includes one of the elements that could have been avoided in the Salem witch trials. The convened special court allowed the admission of spectral evidence against the people who stood accused of witchcraft. Spectral evidence constituted the use of testimony concerning dreams and visions in the court (Marion, 2007). In the cases, the spectral evidence became the critical test of witchery rather than the use of evidence admitted in conventional courts. Spectral evidence involved the accusers witnessing a ghost of the accused causing them harm. Such evidence is unorthodox in a court of law since its validity and accuracy cannot be determined. The Salem witch trials could have integrated judicial prudence and utilized reliable and valid evidence in the cases. The admission of spectral evidence contradicted the standards of evidence for crimes presented in court. A similar standard for the witchcraft evidence would have prevented the erroneous court rulings that led to the execution of twenty people. Over the years, philosophies and ideals have experienced a transformation that cannot allow the replication of the Salem witch trials. One of the changes includes reduced integration of superstition and supernatural aspects in religious beliefs. Although religions acknowledge the existence of the Devil, it is not speculated that the Devil roams among people and empowers witches to harm people. Witchcraft is considered an outdated practice that cannot find a place in the modern society. The current religious systems cannot, therefore, ascribe unexplained phenomena to the works of the devil. Religions have evolved to reduce the emphasis of supernatural beliefs that manifest in our lives. The standards of justice include another change that cannot allow a replication of the Salem witch trials in the modern society. According to the provisions of the law, an individual is presumed innocent until the accuser can prove the defendant’s guilt beyond reasonable doubt. The Salem witch trials allowed the execution of people without concrete evidence of their guilt. It further incorporated spectral evidence as criteria for witchcraft. The current standards necessitate the integration of scientific methods as a justification of the validity and accuracy of evidence. A jury cannot render spectral evidence admissible since such an action would contradict the provisions of the law. The Salem witch trials are an unfortunate event in the history of America. They allowed a miscarriage of justice due to a range of circumstances including prevailing religious beliefs, harsh realities, and public hysteria. The trials were devoid of judicial standards and permitted the conviction of people without adequate proof of guilt. The context of the trials included of the factors that contributed to their occurrence. The prevalent supernatural beliefs including the Devil’s use of witchcraft to harm people aggravated the problem. However, current changes in the society cannot permit the occurrence of a similar incident.